Transform your backyard into a patriotic party scene! This July, celebrate Independence Day with PartyCheap! Our 4th of July decorations are sure to thrill your guests without breaking your budget. We have plenty of patriotic party supplies to suit all of your 4th of July party ideas! Celebrate the Stars and Stripes in style - our red, white, and blue decorations are sure to make your Independence Day party a success with our Independence Day decorations! A variety of our 4th of July party supplies are made of an all-weather material that is perfect for those outdoor summer cookouts! Watch fireworks in the warm July weather with our Outdoor American Flag Banner. Then bring the party indoors for food and fun with our Patriotic Tablecloth and Patriotic Centerpiece! Decorate your home from top to bottom in 4th of July decor! Hang up a 4th of July banner to show all of your neighbors your American pride. When the party's finally over, send your guests home with 4th of July party favors - like our Patriotic Top Hats or Mini American Flags! We carry an assortment of red, white, and blue plates, cups, napkins, bowls, and cutlery. Don't leave the cooler at home; make sure you bring along the Inflatable Patriotic Hat Cooler for keeping all your refreshing beverages ice cold. Next, stick some American flags or some Patriotic Wind-Wheels in the ground beside your set up for 4th of July decor that will flow in the wind. Finally, make sure everybody has dressed the part by giving the griller a patriotic chef's hat. 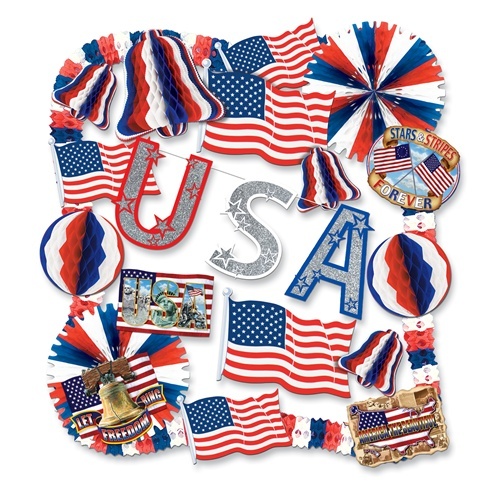 We have countless Independence Day decorations that are sure to please and match every style! Don't forget to make sure the entire gang is sporting patriotic beads and hang up a patriotic banner so everyone can see your American pride! Next time you’re in need of some 4th of July party supplies, make sure you party with us at PartyCheap.com! We take just as much pride in our 4th of July decorations as we do in this great nation and we hope you will too! Bulk discounts are also available to satisfy every party budget! Feel free to call with any questions you may have!